If you’ve ever had a homegrown tomato, you’ll know why they are a must in the garden! If you haven’t had a fresh tomato then don’t wait any longer, grow your tomatoes from seed this year and experience one of the best things EVER! It is no wonder why tomatoes are a popular plant to grow in the garden. They are so delicious fresh; it’s pretty much like eating a whole different variety of fruit! I know for myself, I rarely will buy a tomato from the store because there is just no comparison. But a fresh tomato right off the vine is one of my most favorite things in the garden. So whether you are an experienced gardener, beginner gardener, tomato hater or tomato lover… Try growing your tomatoes from seed! If you typically don’t like tomatoes, try them fresh because I bet you’ll change your mind! And if you don’t feel like you have enough experience to start your own tomato seedlings, give it a shot because it is easier than you think. This part of the process is likely going to overwhelm you (in a good way)! I never knew there were so many varieties of tomatoes out there until I went online to pick out which seeds to plant. The first time I ordered my tomato seeds online I remember getting at least 12 varieties and planting about 6 of each kind. I was definitely in tomato overload that year and have since learned my lesson! Now I keep it to a minimum, only ordering the varieties I really need, but still usually end up with around 6 different varieties. So which variety is best, and where should you get your seeds? There are hybrid tomatoes, heirloom tomatoes, determinate tomatoes and indeterminate tomatoes. Whoa right! Hybrid Tomatoes – Are a cross of two different tomato varieties. They are typically bred for creating a variety that will be disease resistant, bear high quality fruit and or have specific growing habits. Hybrid varieties started becoming popular after WWII, as mass transportation was needed. The hybrid varieties hold up best, which is why they are most popular and most widely used. Unfortunately their flavor is not the best and their seeds are not true to the plant variety. 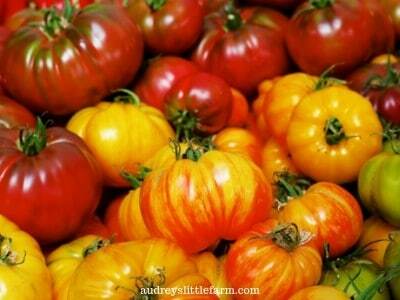 Heirloom Tomatoes – Are the delicious old-fashioned tomato varieties passed down throughout many generations. They may not hold up as well in a semi truck traveling across the state, but they’re the best tasting for growing in your garden. Learning about heirloom tomatoes and what the term “heirloom” actually means is pretty interesting and so if you’d like to find out more, the site Tomato Fest has a great article on What is an Heirloom Tomato. Determinate Tomatoes – These tomato plants are smaller, “bush” varieties that grow around 3-4′ tall. They bloom and produce their fruit all at once. Then after the first harvest the plant is done producing and will start to decline. This type of tomato plant is great for container gardening. Indeterminate Tomatoes – These tomato plants continue to grow and produce fruits throughout the entire growing season until the plants are killed by a frost. They often will need tomato cages or some sort of support since they have potential to grow huge. You can buy tomato seeds everywhere. You’re going to see them in Wal-Mart, Lowes, and likely all places with a garden center. But… I don’t always recommend them. 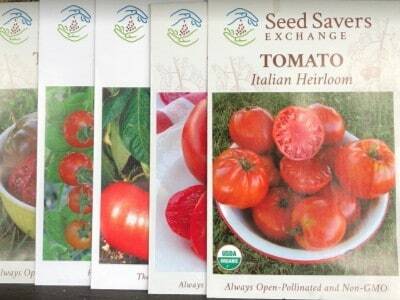 My favorite two places to order seeds of any kind are from: Seed Savers Exchange and Baker Creek Heirloom Seeds. 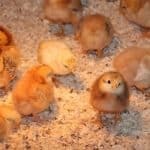 These two companies produce great quality seeds and have wonderful unique selections to choose from. They both have a huge supply of heirloom varieties as well as organic seeds if that’s what you’re searching for. Buying seeds from just anywhere may give you success but what I often find is that they’re cheaper in price but half as viable. Therefore, I may spend a dollar less on the packet but half the seeds don’t germinate. The seeds that I have bought from both Seed Savers Exchange and Baker Creek Heirloom have always been amazingly viable. In fact, I remember last year when planting my Spring garden adding in 2-3 seeds per spot for everything that I direct sowed, just to be sure that at least 1 seed germinated, and every seed sprouted! I don’t think that had ever happened to me in the past and it made me convinced that buying good quality seeds is 100% worth it! So now that we’ve covered what types of tomatoes there are and where you can get the seeds, lets get to the best part! 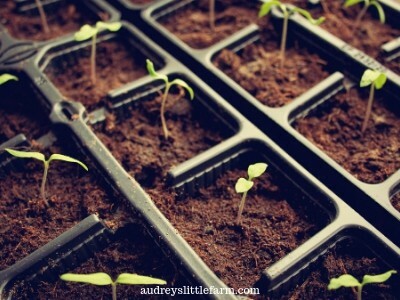 Which is how to grow tomatoes from seed in pots! First, determine your last frost date and start you seedlings 6-8 weeks prior. Second, dampen your seed starting potting mix and then fill up your plastic pots about 3/4 full. Then use the bottom on a similar sized container to gently compact down the soil, creating a flat surface. I recycle all of the pots and 6 packs that plants come in from the nursery and they are what I use to start my seeds in. But before using them, sterilize them in a light bleach solution. 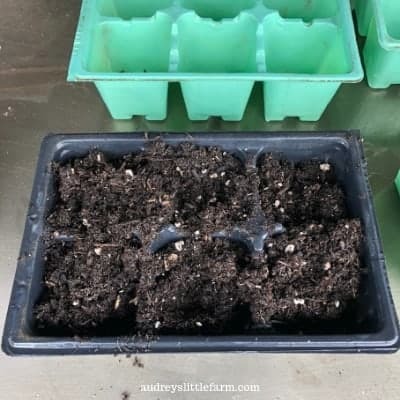 The size I prefer is about 3″ x 3″ which will give the young plants enough space to keep growing before having to transplant them into something bigger. 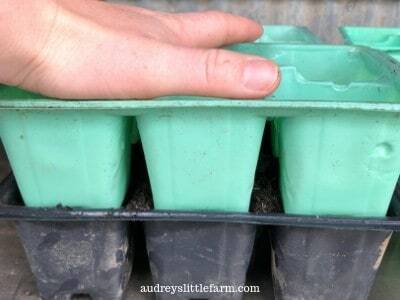 If you use the really small seed starting trays that measure only around an inch wide, you’ll end up having to move the plants to a larger pot too soon. Although, depending on how many plants you want to start, feel free to get creative with the pots you choose. As long as there is a drain hole you can use containers such as plastic cups, styrofoam cups, and peat pots. A good seed starting mix is important because it is made specifically for getting seeds to germinate. 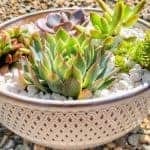 People tend to use “potting soil” interchangeably, but potting soil is best for repotting your plants. If you are starting a plant from seed, a seed starting mix is preferred. 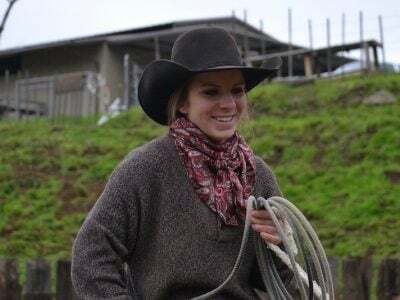 The site, “Morning Chores” has a great article 5 Best Seed Starting Mix for Fast-Growing & Healthy Seed explaining what a good seed starting mix consists of. If you’d like to check it out just click on the link! Sprinkle 2-3 seeds in each pot to ensure germination. 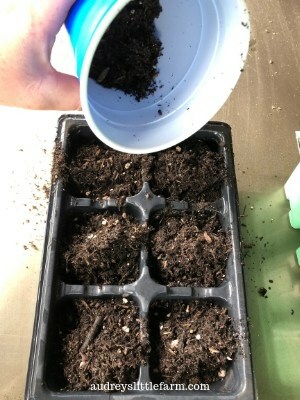 Then cover the seeds with 1/4″ of seed starting mix and gently press down the soil with another pot, or your fingers. Slightly mist the soil with water until damp. You’ll need to continue keeping the pots damp until your tomato seeds germinate. Decide on a place that will get adequate warmth for germination. Tomato seeds need a soil temperature of 60-90 degrees for germination, with an optimum temperature of 85 degrees. If you have a greenhouse that is warm enough, that will be the perfect spot. If not, indoors on a heating mat or in a warm area will work out great. You can also put a heating mat out in the greenhouse if needed. Expect 7-14 days for germination. Once your seeds germinate then you need to ensure that your seedlings are getting plenty of light. 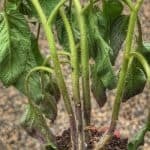 If you’re seedlings are inside of a greenhouse then being under full sun is recommended. If they are being kept inside and only getting partial sun through a window then a grow light will be needed. An LED grow light should be placed 12-30″ above the seedlings and be kept on for at least 12 hours per day. If you notice your plants getting leggy then simply lower the light closer to them. Once your tomato starts have reached 12 inches tall transplant them into gallon sized pots or if you’ve passed your last frost date then transplant them outdoors. 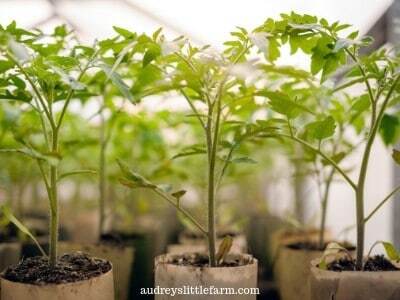 Then simply enjoy and continue caring for your tomato plants! Most plants will have fruit ready in about 80 days from transplant. Mexico Midget – Is a cherry tomato known for being very productive and having great flavor. Italian Heirloom – Is one of the most productive varieties at Seed Savers. It is popular for having great flavor and being ideal for canning and slicing. German Pink – Is a meaty beefsteak variety ideal for canning, freezing and slicing. Black Krim – Is a beefsteak with excellent full flavor and unique color. Amish Paste – Is a tomato with juicy flesh great for fresh eating and making sauce. I am really excited for my garden this year! Some of these varieties I have had but others are new so I can’t wait to see how they turn out! Happy Gardening my friends and good luck with growing your tomatoes from seed! Here are some related posts you may enjoy!